Yaxley, Farcet, Holme and District AC anglers fished their final match of the season on the Bower, a venue that has seen a lot of action over the past few weeks. Thankfully it held up well although the bigger roach and skimmers failed to show. Ivan Marriott led the way with over 100 small fish for the winning weight of 6lb 12½oz. Fishing a four-metre pole, he caught roach, skimmers, and a surprising amount of bleak on bread punch. Runner-up was Frank Bevilacqua on the end peg. He fished similar tactics to the winner, but also caught a few bonus perch to finish with 6lb 1oz. Third place went to Brian Warren on 4lb 1½oz. Orton Upstream on the River Nene saw Peterborough & District anglers fishing the last match of the season. It was not far off a perfect river, but just had a little too much colour and flow. 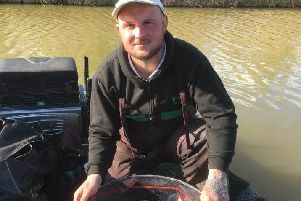 Out in front was Neil Beeby with a weight of 8lb 12oz catching skimmers and one good bream on the pole over groundbait. Runner-up was Mike Smith with a weight of 4lb catching roach on maggot on a long pole line and in third place was Paul Dotchin with 3lb 6oz fishing the feeder.